Silver Metallic bodywork with black leather interior and 225 PS 1.8T engine. Supplied by Autohaus Tauwald, Erlangen, Bavaria in full UK spec. Registered new in the UK by Bristol DVLA on 16/10/01. 8 owners in 17 years. The importer was owner 1 so can be ignored. In 2002 at 16k miles it was sold by Monaco Cars to owner 3, a gentleman from Berkshire. On 22/6/07 it was purchased by owner 4, a gentleman from Swansea after which in April 2008 it was sold by established Jaguar specialist Chiltern of Bovingdon to owner 5, a gentleman from Reading, Berks and later that year he part exchanged it at a main dealership from where we acquired it. We sold it to owner 6, a repeat customer from Kent on 7/10/08 who part exchanged his Porsche 944 with us and he sold it back to us delivering it on his way to see relatives. He had used it as a second car using an Audi A3 every day but with a Mercedes SLK also in the household and also being little used, it was decided to let the TT go. We sold it to owner 7 a mature gentleman from Derbyshire who traded it in with us for a 2008 TTS Coupe. 74000 miles with a near full service history in original service book (see images above). Cambelt next due April 2019. Four good Goodyear tyres. We've just replaced the sump as the garage that looked after it for the last owner repaired the sump plug thread unsuccessfully and it leaked. We also cleaned the oil pump strainer though it was all exceedingly clean down there, so much so that had we been refitting the original sump, we wouldn't have needed to clean it. The last few service receipts note the clutch as being heavy but we find it acceptable and it operates correctly with a decent bite point and no slip. MOT to 29/7/2019 (no advisories). We are in the process of replacing the air conditioning compressor, a heated seat switch and the headlight washer pump - in total very costly repairs very few if any other sellers would bother doing or even point out. Complete owners manual wallet. Tonneau cover supplied (so many don't come with one, £450 from Audi), spare remote key. Usual 225 spec of xenon gas discharge headlamps, 17" '6 arm' alloy wheels, multi function computer, Bose sound system, power hood, remote central locking, alarm/immobiliser, 3 spoke sports steering wheel, heated leather sports interior, electric wind deflector, ESP traction and stability control, 'quattro' all wheel drive.Factory option 6 CD changer and upgrade to Concert II CD/tuner head unit. 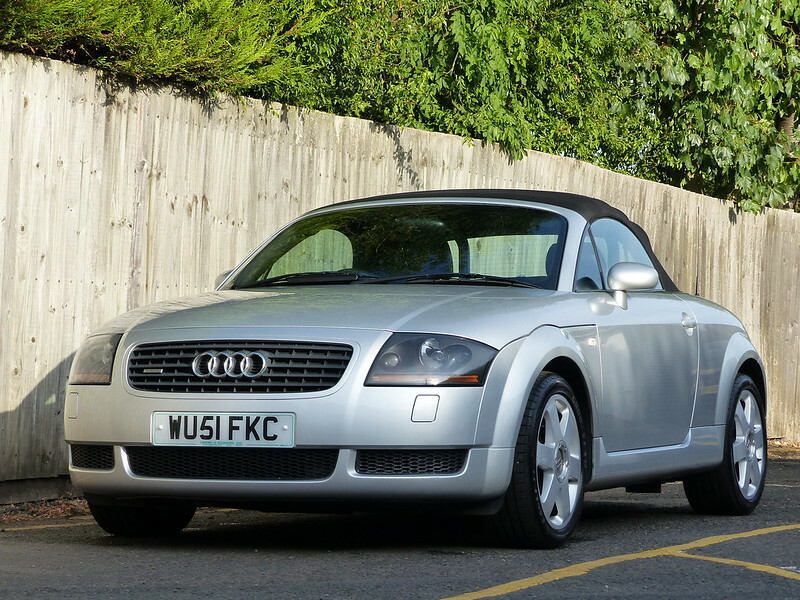 This 17 year old TT is exceptionally good for its age and mileage. The bodywork is largely excellent and has mainly original paintwork. The windscreen is still the original and is free of any significant damage. The interior has a bit of wear but it's still very respectable in there with no smells and perfectly clean. The roof works as it should do and the very valuable and often missing tonneau cover is present. This TT drives correctly and is surprisingly tight, testament to the high levels of maintenance its received from its last 2 owners. It's not perfect but considering how far from perfection most are these days, I'm confident it's one of the best at this price point.